How to find a range of values of x for an increasing or decreasing function? The following diagrams show how to determine the range of values of x for an increasing or decreasing function. 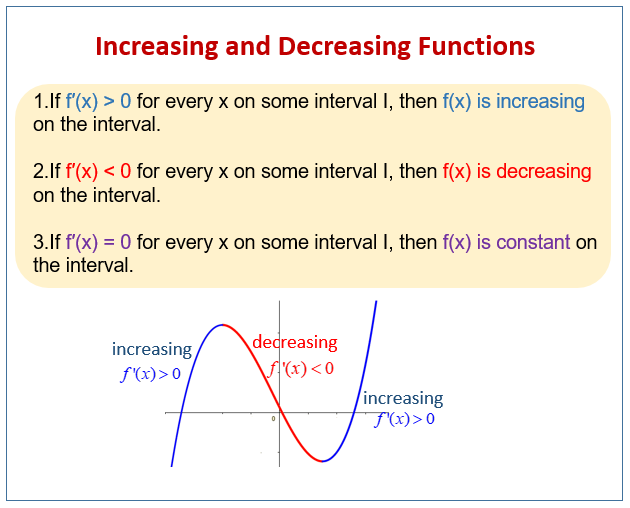 Scroll down the page for more examples and solutions on increasing or decreasing functions. This tutorial shows you how to find a range of values of x for an increasing or decreasing function. Find the range of values of x for which y = x3 + 5x2 - 8x + 1 is increasing. For what values of x is y = 150x - 2x3 an increasing function? y = x2 - k√x, where k is a constant. (b) Given that y is decreasing at x = 4, find the set of possible values of k.
1. Prove that the curve y = x3 + 3x2 + 3x - 2 has only one stationary point. Show that the stationary point is a point of inflection. 2. Show that the curve y = 4x - x4 has only 1 stationary point. Determine the nature of this point. 3. Show that y = 1/3 x3 - 3x2 + 10x - 2 is an increasing function for all values of x. 4. For what values of x is y = x3 - 3x2 + 5 a decreasing function?